Arz was selected by The Ministry of Home Affairs, Government of India for award for outstanding work done by an NGO in the field of Anti Human Trafficking for the year 2011. Arz received a rolling trophy and certificate of merit by Government of Goa in 2011, in recognition of the invaluable services rendered in the field of Social work. 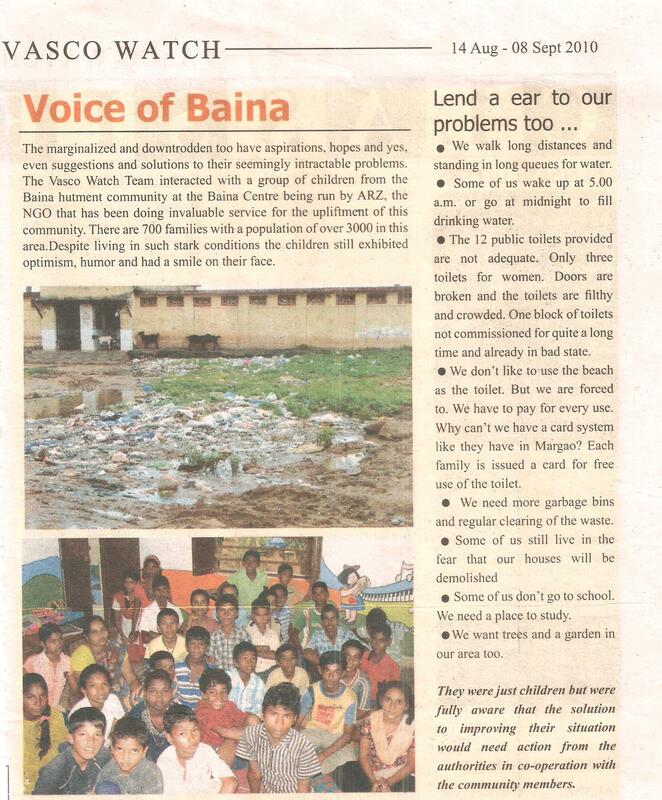 Arz mobilized media persons from the local neighbourhood newspaper from Vasco to interact with the children at the centre at Baina. The children were enabled to share their problem and concerns that they are facing in their area. Apart from the interaction the children also clicked photography’s of the garbage problem they face. International Day of Climate Action was celebrated with ''The 350 Campaign'' that went on to become the "World's most widespread day of political action' on Saturday 24th October, 2009 with 5245 actions in 181 countries. 350 being the safe limit of number of Carbon Dioxide parts per million in the atmosphere for humanity. 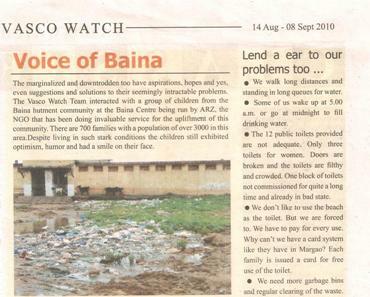 Two girls from Swift Wash took part in the day long event that took place in the community in Vasco. The on lookers painted messages and slogans on the 350 meter canvas which was cut and stitched into bags on the spot by the two girls for the people to buy. It was a very good experience for them to be a part of the Community, talk and interact with the general public. They got a unique chance to pass a message to the society about climate change and saying no to plastics. Back at Swift Wash they passed on the message to the other beneficiaries and made paper bags for the other members of the organization ensuring plastic is least used atleast at Arz and Swift Wash. Swift wash celebrated its third anniversary on September 1, 2009. The beneficiaries along with the staff went for a day-long picnic to a nearby beach, selected after a poll, keeping safety precautions in mind. Shopping, cooking for the picnic, and getting everything ready was all done by well-organized teams selected for the purpose. 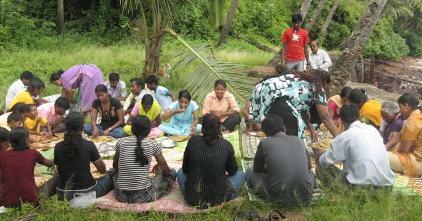 All the members took part in planning and organizing the picnic in more than one way. It was a great opportunity for the beneficiaries to forget their inhibitions, fears, worries and truly enjoy to the fullest. In the evening, there was cake cutting at the laundry and the celebration ended with the boys and girls dancing to the tunes on the stereo. Swift Wash was awarded the Godfrey Phillips Bravery Award in Social category for the economic rehabilitation initiative for victims of CSE. The Award presentation was held on June 18, 2009, at the Hotel Trident, Nariman Point, Mumbai. Ms. Renuka Madar, President, Swift Wash received the award on behalf on Swift Wash. The Arz website has gone live. An interaction of Arz staff with the delegates from Government of Bangladesh who came to study the trafficking scenario in India. 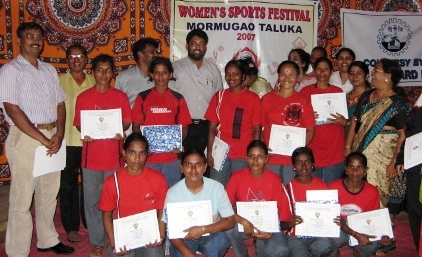 Police Training Conducted by Arz and Swift Wash in May 2008 - throwing light on the problems faced by women in joining economic rehabilitation programme and the kind of assistance required from the police officials. Swift Wash beneficiaries with the Dy. 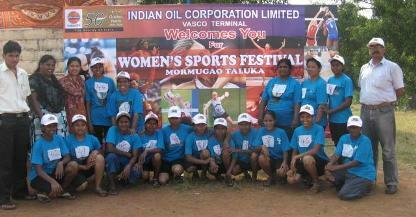 Collector Mormugao after securing 2nd place in Kabaddi at Mormugao Taluka Level Competition.